and the way she got that job was basically the same way i learned to play ice hockey. by being fully supported, encouraged, and sometimes terrified of her own mother. worth the watch. at the end of that job, her mother asked, "what did you learn from that job?" maya said "i don't know"
"you learned that you're strong and with determination and dedication you can go anywhere in this world." my friend and former colleague, Brad Stone's book about Amazon but really about business and people. here it is in the iTunes store! hello from 2015! here's the latest from Gretchen's library! Download the book on iTunes or Amazon and change your experience of life. Kara Swisher interviews the POTUS. Be still my heart. Re/code is doing it. Loved President Obama's answers to these very tough questions. Issue of encryption is, I think, is becoming increasingly more important than ever and one that the US government needs to lead. After all, we created this technology-based economy and we'll also be the ones up in arms if our safety is compromised from something we could've prevented. Remember how mad we got about Uber's godview?...yeah, and that was just for rides to a party. 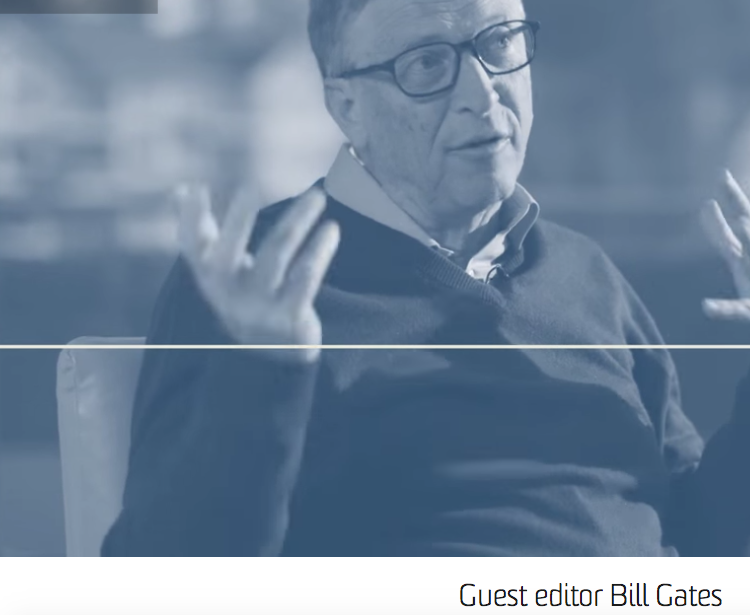 Guest editor Bill Gates on The Verge talking proliferation of mobile banking as it relates to the unprecedented rise of mobile devices in third world countries. Change comes quickly when net 2 billion devices join the internet and small transactions that were previously inefficient with high barriers to entry become possible. The future is limitless. Sign. Me. Up. This seems to be the motto of every great leader I know. I do love my Management & Leadership books...see previous blog posts. Sheryl Sandburg and Adam Grant have been writing this five-part series about women at work. This one in particular struck a chord with me. The latest in the series, it is bizarre to me that we all-too-often automatically delegate household-type chores to women in the workplace before we think to assign this type of work equally amongst the team or delegate to a more junior employee. I'm not sure where I net out on 'Office Housework' -- it's a little like the nature vs. nurture argument: if you spent your entire professional life organizing, ordering and supporting an organization, then you will, of course, end up in a more high-touch, less analytical, more people-focused type job -- IF that's what you were aiming for. If, on the other hand, you'd prefer not to end up in a people-first type of job, perhaps it's more logical to start or pivot one's career towards analytics, engineering, programming, IT or finance. It's taking a month, three months, a day, a year -- whatever you need to to get back to a state of ease. Where you can perform as close to 100% capacity as your body will allow. Trust me when I tell you: your students will appreciate you taking time to heal, your co-workers or future co-workers, your partner and family. You will be much better at whatever you do if you're really honest about the body's need to heal. Oh, and meditate. Do that too! (first, the preamble): It's no secret if you've ever worked with me that I learn in a very specific (and some might say, unique, way). I'll save the back story for another time but short version: growing up, our family did not have cable TV and for many years, didn't have a TV at all. This led to the Sword children learning quite differently than other children. For me in particular, I've noticed that friends of the same generation are able to watch something on TV and learn about the subject matter at hand. I tend to watch things and fall asleep...I do not learn by watching anything, really. In order for me to truly learn a subject matter, I need to hear it, experience it and see it. (In that order). (And ultimately, teach it). I actually suspect that things like the Serial podcast (which gained such enormous traction last Fall) are this generations' response to how we learn -- it's quite different from how it used to happen. Anyway, that's for a different blog post. Enter Audible.com -- an internet 1.0 company that survived the fall-out and one that I have huge respect for. Don Katz (Audible CEO) & Guy Story (Audible Chief Innovation Officer) are some of the most interesting & innovative people I've met on this side of the Mississippi -- and they've pioneered a technology that, while simple, is a life-changer for people like me. My Audible.com playlist is filled with non-fiction, education-based books. Although I must admit I own this particular book in hardcover, on iTunes AND on Audible....when I want to check back on historical data to help inform future predictions OR I simply want to remember a time in our country's recent financial history, I put this book on my Sonos sound system and get to listening. 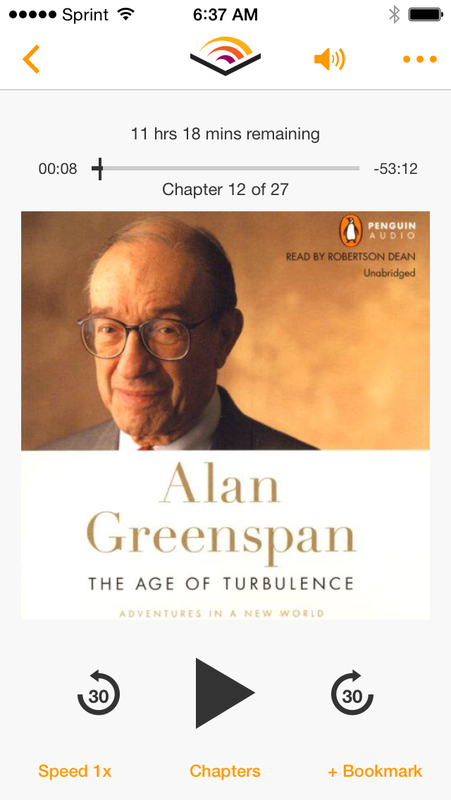 This is a wonderful book because Alan Greenspan has a brilliant way of bringing the reader right back to the time and place where policy was affecting market conditions. Where his decisions as Fed Chairman seemed to change the axis on which our earth was spinning. Where the markets began to reinvent themselves to create the environment we see today. Because he was Fed Chairman for SO long (1987 - 2006) and served as an adviser and friend to many of the President's of the United States over the course of his professional career, he has a unique and welcome disposition in the changing tides we live through: one that I hold in high esteem when I look at our collective future. Finally, can't leave this bit out -- I've been a student of the Federal Reserve since 2003 when my mentor and teacher, Professor Pat McGuire, told me if I understood macroeconomic conditions, I could understand how economies everywhere work. Thusly, I've owned this book since it was published (an untimely publishing -- in the middle of the recession)...and studied it like a textbook since that time. Last summer (2014) I got to spend the weekend with the co-author of the book, Peter Petre. Life has a beautiful way of coming full-circle just when you least expect it...stay open, stay curious, kiddos, you never know where it might lead you. With that, I bid you adieu until next time -- would love to know what YOU are reading/watching/consuming! Write it below or drop me a line. P.S. Thanks @Nathan Ingram for the assist with the WP images on da blog. 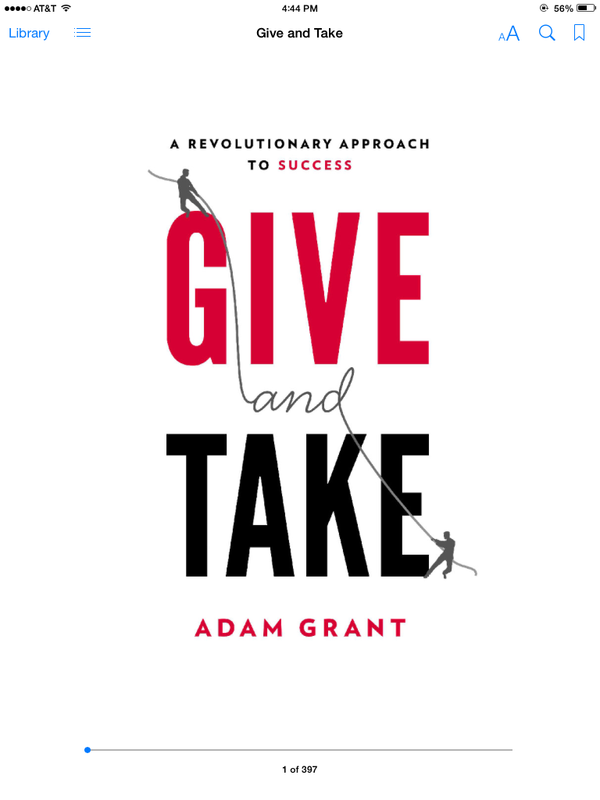 begin again, beginning, books, multitasking, new media, strategy, student always, things that contribute to my way of thinking, untraditional marketing, what am i reading? i think this is a more important conversation than we realize. today, we have the power of technology, unrivaled communication tools and more computing power available to us than ever before. but we get bogged down. and in our own way. the 'old way' of doing things befalls us...all the time. ALL.THE.TIME. think of the last time you thought a person shouldn't get ahead because they haven't 'put their time in.' working well is working responsively, quickly, adeptly no matter how much experience or hierarchy you have in your company. key element to success: hiring well so that the people every (metaphorical and literal) room are delivering the best final product: whatever your product is. My friend Ashley wrote this rad piece on MindBodyGreen about the truth about multi-tasking (no surprise endings here, y'all: no one can do it well). ^related: when did AppAnnie become like the Nielsen of apps and let me know when they're raising their next round? k, thanks, bye. two people whose opinions matter deeply debate the issue of our time. just.hit.play. I am not resigned to the shutting away of loving hearts in the hard ground. So it is, and so it will be, for so it has been, time out of mind: Into the darkness they go, the wise and the lovely. Crowned With lilies and with laurel they go; but I am not resigned. Lovers and thinkers, into the earth with you. Be one with the dull, the indiscriminate dust. A fragment of what you felt, of what you knew, A formula, a phrase remains,—but the best is lost. The answers quick and keen, the honest look, the laughter, the love,— They are gone. They are gone to feed the roses. Elegant and curled Is the blossom. Fragrant is the blossom. I know. But I do not approve. More precious was the light in your eyes than all the roses in the world. Down, down, down into the darkness of the grave Gently they go, the beautiful, the tender, the kind; Quietly they go, the intelligent, the witty, the brave. I know. But I do not approve. And I am not resigned. "Dirge Without Music" by Edna St. Vincent Millay, from Collected Poems. © Harper Perennial, 2011.
and for all those curious about what ACTUAL books i'm reading - here's the latest screenshot of my iBook collection. send me yours! 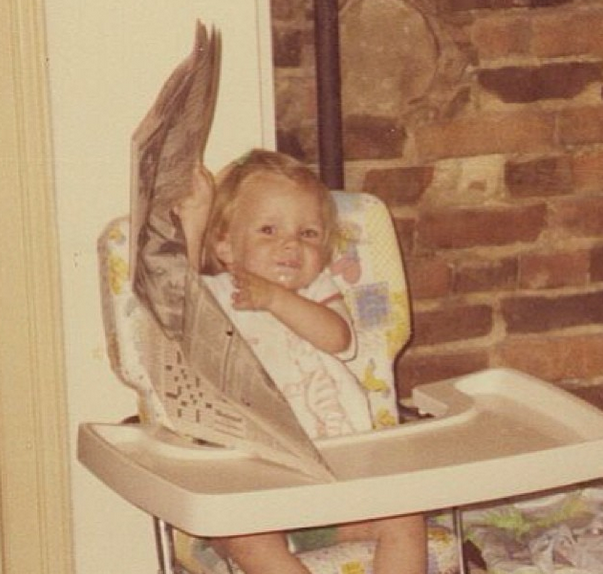 till next time, y'all - let me know what YOU are reading!! content, places i admire, student always, things that contribute to my way of thinking, video, what am i reading? // my own personal hero. i think he's changed all of our lives in a way we won't know the impact of for a long time (if ever). also, in hero category: Glenn Greenwald and James Bamford. and all the orgs that are keeping the documents safe - like First Look Media. undercurrent practices what they preach! it's so refreshing to see a strategy company turn the gaze inwards and see if they are practicing what they preach! an interesting take on what certainly is a changing culture. .....catch y'all next week for another edition of WHAT I'M CONSUMING! it's like he's reading MY blog!